Quick Take: Parks and Recreation, "The Bubble" & "L'il Sebastian"
Review: Parks and Recreation, "The Bubble" & "L'il Sebastian"
(S0315 / S0316) There’s a theory or concept or something making the rounds on the internet where critics are debating if Parks and Recreation is The Wire of situation comedies. While I can sort of see it, I’m of the opinion that this is kind of silly (though no worse than the Community-as-Deadwood theory), but that doesn’t mean I wouldn’t be really excited to see Leslie’s (Amy Poehler) potential mayoral candidacy mirror that of Tommy Carcetti’s. Because it appears that public office is going to be on Leslie’s horizon next year and I think it’s a logical-yet-exciting step for the show to take for two reasons. One, with the ratings the way they are, there’s no guarantee that Parks will live beyond season four (though, by NBC standards, the ratings aren’t exactly terrible…but by overall network television standards…yikes). Why not stave off any kind of emotional let-down by going big in what could possibly be the show’s swan song. The second reason it makes sense to go in this direction is that Parks and Rec has from the beginning been a show that strives using focused story arcs to expand the universe of Pawnee. Putting Leslie in a race for the mayor (or I guess a city council seat, but I would guess the political backing committee we were introduced to at the end of “Li’l Sebastian” will push her for the top job) not only raises the stakes, but opens a door to a wide variety of new (and likely terrifying) characters that don’t always have direct interactions with the parks department. Everything about pushing Leslie in this direction makes so much sense, and I have to credit the writers for still for making it into an exciting and unexpected cliffhanger of sorts. But that’s what happens when the rest of the episode (well, really two episodes, but it was marketed by NBC as a single, hour-long season finale) is so damn funny. In part one, “The Bubble,” Ben (Adam Scott) has a meeting arranged with Leslie’s mom and Leslie is mortified because her mom is something of a ball-buster. I’m not sure I remember this character trait being developed so much the first few times were introduced to Marlene, other than Ron’s colorful description of her in season one. Still, Pamela Reed plays it well, so who am I to complain. After a troublesome first encounter, Leslie coaches Ben into how to best deal with Marlene’s tough exterior, but this only leads to the older Knope making a pass at him. Or is it just a well-timed political tool to help get funding approval from Ben to purchase more school buses? Regardless, everyone seems happy and Marlene mentions how she approves of Ben. Ron promises to keep the secret, but warns them that they are treading into dangerous waters. With the maintenance man, Leslie and Ben decide to me more proactive and give him the day off in exchange for his silence. But that day off coincides with the lavish funeral ceremony for the honorary-degree-from-Notre-Dame-receiving miniature horse, L’il Sebastian. So with all of his jobs being marginalized to different, less-qualified people, disaster eventually strikes. And when Jerry (dammit Jerry) uses lighter fluid to fuel the eternal flame, the lighter of said flame, Ron, ends up burning his eyebrows off (dammit Jerry). Still, from an outsider’s perspective, the giant fireball that was created looked pretty stunning and was part of the catalyst to get the exploratory committee interested in Leslie’s potential political marketability. Leslie’s upcoming campaign (which will likely still have to continue to dodge around her secret relationship with Ben) isn’t the only plotline for season four that was teased at the end of the episode. After Andy (Chris Pratt) writes the well-regarded “5000 Candles in the Wind” for L’il Sebastian’s funeral, April (Aubrey Plaza) helps him market the new singles and new full-length album to city hall employees ($18 for the single, $18 for the album, $40 for the pair). i.e. Kyle (possibly my favorite tertiary character on a show filled with tons of them). Chris and Ann (Rashida Jones), meanwhile, seem to reconnect in the face of Chris’ realization of his own mortality following a bout with shoulder tendonitis. But this isn’t the only love reconnection on the horizon, just the least terrifying of the two. At the after funeral soiree, Tammy (Megan Mullally) shows up to just be…awful. But it seems Ron has grown up enough to finally ignore her cruelty/advances. But when Donna (Retta) warns Ron that his first ex-wife, Tammy One, is here as well, it’s enough to send Tammy Two fleeing in horror. We don’t see who Tammy One is yet, just a shadow in his office. I’m going to start the casting rumors right now though: Tammy One WILL be played by played by Academy Award winner Marion Cottilard. Just wait and see. Finally, in maybe the biggest shock, Tom (Aziz Ansari) resigns from the parks department to follow his entrepreneurial instincts with Jean-Ralphio and his new multimedia entertainment company Entertainment 720 (because they’ll go around the world twice for their customers), an organization that already seems destined for complete failure, at least in the eyes of employee-on-retainer Detlef Schrempf. But unlike Mark (Paul Schneider) leaving the public sector for the private one, I’m going to bet we still see Tom’s wacky adventures next season as well. 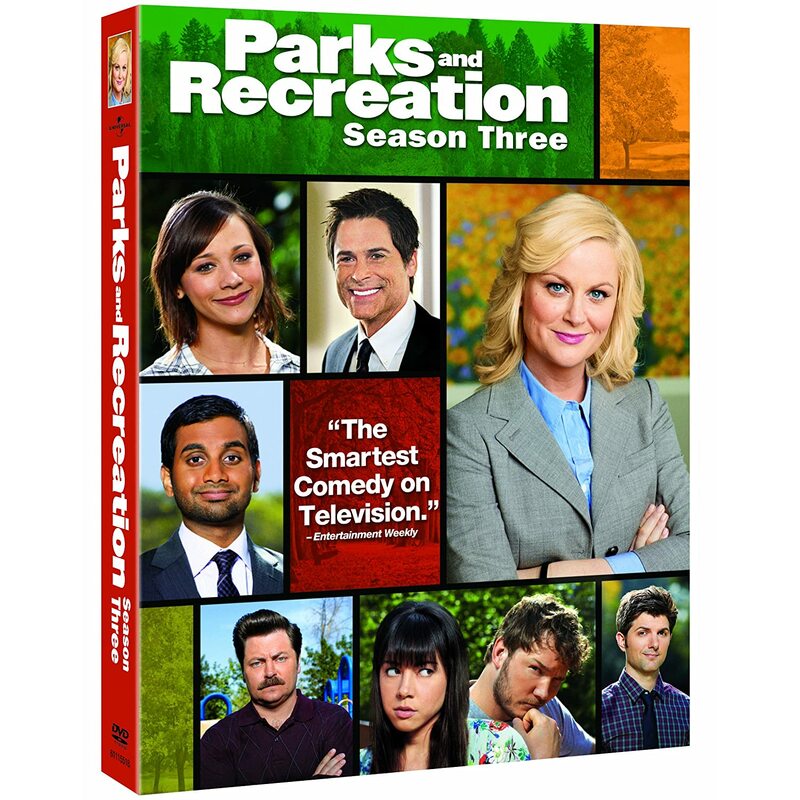 So what can we say about this season of Parks and Recreation as a whole? It was pushed to mid-season for the sake of Outsourced. It was truncated down to just 16 episodes. And yet, it persevered and solidified itself as the very best comedy on television. I used a lot of superlatives like that in my reviews, probably (definitely) to a fault, but I really can’t praise Parks and Rec enough. And I’m just really happy we won’t have to wait until January 2012 for season four. So bring on the fall. I would love to see Detlef Schrempf be a recurring character throughout season four. Dude’s got comedic chops. Okay, if for some reason Marion Cotillard is unavailable, who would you like to see play Tammy One? Speaking of Mark, we were told he might make an occasional appearance on the show, but didn’t in season three. Will we see him next year? Seeing a Leslie’s main mayoral opponent would likely be the incumbent Mayor Gunderson, I have to ask, have we seen him appear on screen yet? We hear so much about his mischievous dog, but what about the big cheese himself? Parks and Rec seems to stay pretty non-partisan when it comes to Leslie’s political inclinations (unlike Ron's), but you would think her party-of-choice would have to be addressed if she were to run for office. She seems to lean left, but then again, you could make arguments for the other side. I’m interested to see if/how this is addressed. I loved the return to the dreaded fourth floor that we were first introduced to in “Tom’s Divorce.” Just another example of what a great sense of place Parks and Rec has. Parks & Rev and The Wire... I think I smell a TVGA Roundtable coming. Great job covering this amazing comedy Mike !